Comedians doing theatre all talk? 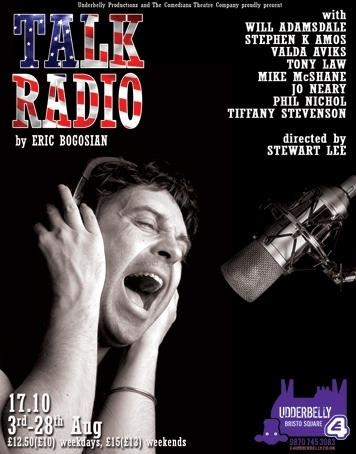 Eric Bogosian’s Talk Radio, was the 2006 offering from Phil Nichol‘s Comedian’s Theatre Company. It played the 2006 Edinburgh Fringe, boasting a cast including Will Adamsdale, Stephen K Amos, Tony Law, Mike McShane, Tiffany Stevenson & Phil himself. Stew did not perform a standup show at this year’s Edinburgh Fringe, but directed this Comedian’s Theatre Company production.